Money lights up the sky at night. They say that New York City never sleeps. Even at three in the morning, subway cars trundle through dark tunnels, cabs zip across surface streets, and the city glitters with streetlights and brightly lit billboards. 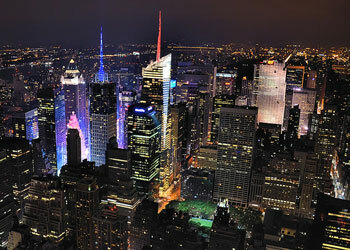 In a satellite image of the United States at night, New York City shines brighter than anywhere else on the continent. But while the data were an interesting tidbit thirty years ago, nobody thought to harness them to look at serious economic questions. Now Storeygard and Brown University economists Vernon Henderson and David Weil have turned those pretty nighttime satellite pictures into a unique measure for economic growth, allowing them to fill in data gaps and answer questions that have traditionally stumped economists. Normally, when economists talk about economic growth, they use a measure called Gross Domestic Product (GDP), an index that measures the value of all the goods and services in a country’s economy. Essentially, GDP is a score that tells economists how a country’s economy is faring with respect to other countries, and how it is growing or declining. To calculate a country’s GDP, Weil explained, researchers need a lot of data, including an accounting of all of the goods and services produced in a country, and the prices people paid for them. The problem with getting good GDP data is that in poor countries, much economic activity does not get recorded in official measures. People might hide their business from the government to avoid taxes, or they might be bartering for goods and services, in ways that the government does not track. That makes it difficult to estimate the true GDP, which in turn makes it difficult for economists to analyze what is going on economically in poor countries, and whether new development policies are working or not. The resulting lights data showed a clear correlation with economic activity, although they were not as accurate as standard GDP data. “We don’t think that lights data give us a better estimate than what we currently have, but we think that it gives us a different estimate,” Weil said. The researchers combined their lights-based estimate of economic activity with traditional GDP data to get an even better measure. “Two uncorrelated measures are better than one,” Storeygard said. Because the errors in the two data types came from different sources, he said, a combined indicator reduced the overall error. Researchers can now start to tackle difficult questions that have long challenged them. In a 2012 study, Weil, Henderson, and Storeygard asked several questions about economic growth in Sub-Saharan Africa, a region with particularly bad economic data. First, they wondered whether economies in coastal regions were growing faster than those in land-locked areas. Because coastal cities in Africa tend to be bigger economically, the researchers suspected that they might also be growing faster. But when they examined the data, they found the opposite. Second, the team wanted to know how quickly big capital and coastal cities, known as primate cities, were growing in comparison to smaller cities. Again, the team’s initial guess was wrong: the economies of big cities were growing more slowly than those of the smaller ones. Finally, the scientists asked whether malaria, a deadly disease spread by mosquitoes, was stunting economic growth. Weil said, “A lot of economic work has theorized that malaria has an important effect on economic growth.” It seems likely that if malaria were eradicated, economies would grow faster. But without good economic data, nobody could answer this question for sure. The researchers used lights data in regions where malaria had been reduced, and found that in fact, the disease had not seemed to affect aggregate economic growth. Croft, T. A. 1978. Night-time images of the Earth from space. Scientific American 239: 68–79. Henderson, J. V., A. Storeygard, and D. N. Weil. 2012. Measuring economic growth from outer space. American Economic Review 102(2): 994–1,028, doi:10.1257/aer.102.2.994. Doll, C. N. H. 2008. Thematic guide to night-time light remote sensing and its applications.